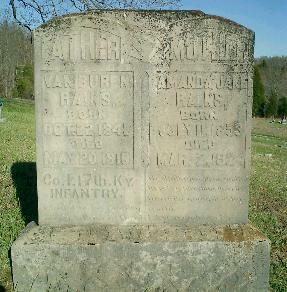 Van Buren Rains enrolled in the 17th Infantry on November 24th, 1861. He was mustered in on January 4th, 1862 at Calhoun for a three year enlistment in Company I. Was private till August 24th 1864, the Corporal. He was mustered out with his unit on January 23rd 1865. There are no other comments in the AG Report. His tombstone shows his dates of birth and his marriage to Amanda Jake.